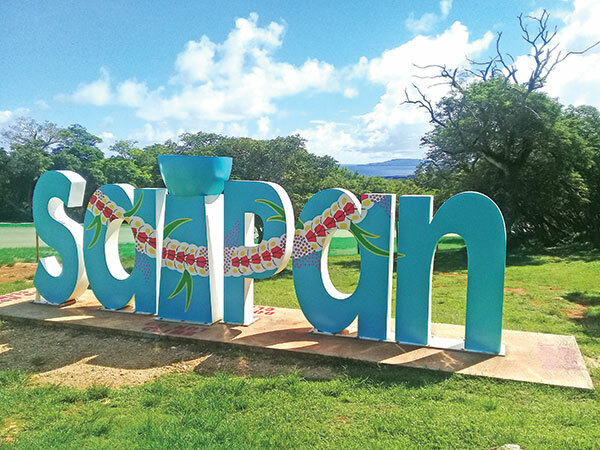 The giant Saipan sign at scenic Marpi, newly painted blue and drawn with the representation of a head flower lei, locally referred to as mwar mwar, is drawing praises from tourists and in social media alike. “It’s so pretty. I love the color,” said a woman after seeing a picture of the newly painted sign in social media. “The art is beautiful!” another person commented. “Island pride. Job well done,” an observer said. Since the Marianas Visitors Authority unveiled the sign in July 2017, it has become one of the most photographed sites in the CNMI. The original sign was painted plain white. The MVA commissioned art teacher Peter Aldan this year to freshen it up. Aldan, a long-time art teacher at Kagman High School, is also an adjunct art teacher at the Northern Marianas College. He and Shayne Villanueva are co-owners of Roil Soil, a company that does clothing merchandize and also engages in promotional events. Aldan, with the help of Villanueva, completed the painting last Sunday after two weekends. 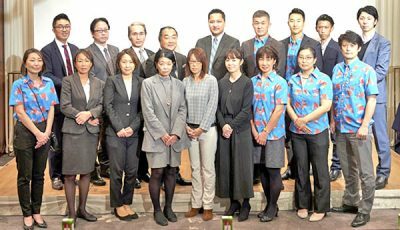 “We want to kind of reproduce the CNMI flag. Color blue represents the ocean and everything. It has the latte stone. It has a mwar mwar,” Aldan said. He said they wanted to incorporate the mwar mwar but they wanted to make it look like the sign was wearing it. “The mwar mwar itself is kind of looks like a necklace lei draping over the Saipan sign itself,” he said. Aldan created the design. Including the actual design and the process for getting this sign painted took them a couple of months. The work is already completed in terms of just getting the painting done. “All we have to do now is determine a clear coat, what kind of clear coat options we have for it,” he said. 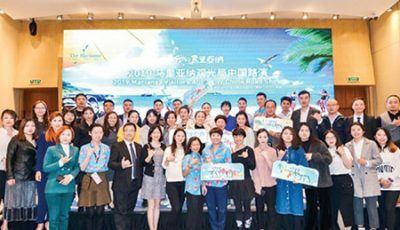 The giant Saipan sign was an idea of MVA managing director Christopher A. Concepcion when he first joined the MVA in 2016. Concepcion said that, in his many travels to other places around the world, some of the most iconic photos taken are those with giant destination signs that essentially advertise the place. “It’s perfect for Instagram, Facebook, and other social media platforms because people instantly know where you are and more than likely want to learn more about our islands,” he said. He said he wanted to bring that experience to the CNMI so their product development team worked with contractors to build the original sign. “It’s now been a little over a year since we did the unveiling so we wanted to freshen it up and add some color to it so we partnered with local artists at Roil Soil to come up with a design and we have what you see now in Marpi,” Concepcion said. He said MVA is not done yet with the site so they ask the public to refrain from entering the fenced-off area while they complete the project. MVA is planning to landscape the place with some flowers and trees to prevent vehicles from destroying the grass area. He said their goal is to enhance the overall aesthetic appeal of the site. “We are excited about the official unveiling despite it being leaked through social media,” Concepcion said.